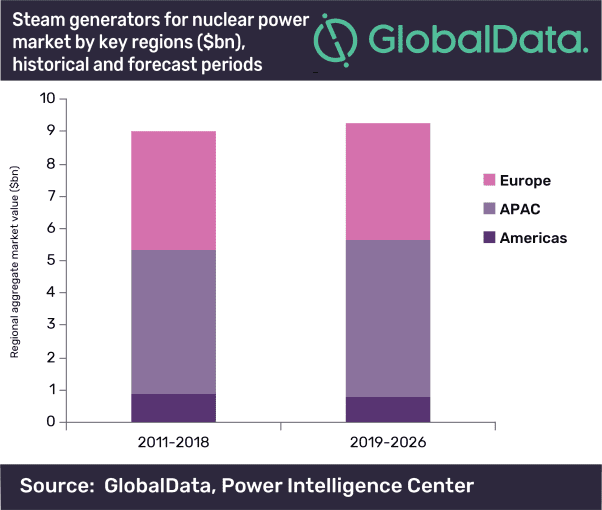 The global market for nuclear power steam generators is projected to grow marginally to reach $1.02bn in 2026, growing at a compound annual growth rate (CAGR) of 0.5% between 2019 and 2026, according to GlobalData, a leading data and analytics company. The market for steam generators will be dominated by new installations; however replacements will witness higher growth over the forecast period. The company’s latest report: ‘Steam Generators for Nuclear Power, Update 2019’ reveals that the market for new installations is expected to hold steady, whereas replacements will witness significant growth. With countries shifting towards low carbon power generation and resource diversification, nuclear will remain vital to the power sector development for many countries across the world. However, the push towards nuclear power adoption is not uniform worldwide, with anti-nuclear sentiments defining the pathway for nuclear power development in certain key markets. APAC is expected to dominate the market with $4.8bn by 2026. The inclusion of nuclear power in China and India will drive the new installations market, whereas Japan and Republic of Korea will see their markets slowdown. Other countries within APAC such as Vietnam, Bangladesh, and Uzbekistan have strong projections for nuclear, driving the regional market for steam generators. Although second to APAC, Europe is likely to be the fastest growing market, with the market value expected to grow at a CAGR of 11.4%, supported by Russia and the UK. The Fukushima disaster in 2011 was the watershed moment for the nuclear power industry, following which anti-nuclear views grew and governments opted for measures that restricted nuclear power growth. Countries across the world such as Japan, Germany, France, and Republic of Korea proposed reducing the role of nuclear power. Operational safety took precedence contributing to a growth in the replacement markets of Americas and Europe. Moreover, the need to generate electricity from nuclear as securely and safely as possible will continue to drive the replacement market and support the development of nuclear power plants with the highest level of safety. The report provides an overview of the steam generators for nuclear power market at global, regional (Asia-Pacific, Americas, Europe), key country (the US, Canada, China, India, Japan, Republic of Korea, Russia, the UK, Ukraine, and France) level and in emerging economies such as (UAE, Pakistan and Iran). The report analyses the market for steam generators in the historical (2011–2018) and forecast (2019–2026) periods. It covers steam generators used in new installations as well as replacements and includes cumulative nuclear installed capacity and annual nuclear power generated at global, regional and country level. It outlines the market drivers and restraints and provides an outlook on key policies and regulatory bodies governing nuclear power in key markets. Steam generator market trends with respect to volume (units), capacity (GW) and value ($m) between 2011 and 2026 are assessed. Moreover, the report presents the competitive landscape, key companies operating in the market and major upcoming nuclear projects. Department of Energy Grid Study Highlights Renewables’ Growing Role in Electricity Markets Across the U.S.